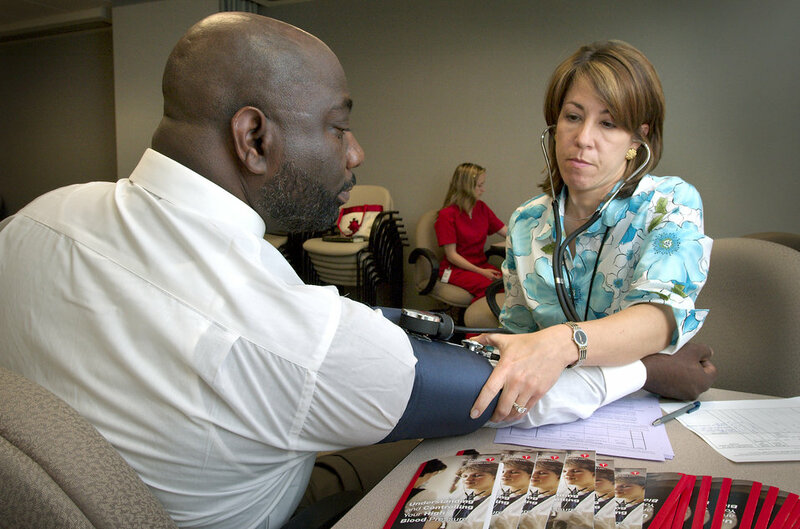 Here, CDC employee, Terry Giles (left), was shown having his blood pressure read by Robyn Morgan, of the National Center for Chronic Disease Prevention and Health Promotion (NCCDPHP), during a 2005 CDC blood pressure screening event. Campuses included were Century Center, Chamblee, Corporate Square, Executive Park, Koger, and Roybal, and was provided by the Office of Women's Health (OWH), Office of Health and Safety (OHS), NCCDPHP's Cardiovascular Health Branch (CVH), as well as volunteers from various other centers, institutes, and offices (CIOs). This annual event was held in observance of National High Blood Pressure Education Month, National Nurses Week, and National Women's Health Week.High blood pressure (HBP), or hypertension, is known as a 'silent killer' for people who have HBP often do not experience symptoms, but are at greater risk for heart disease and stroke, which are leading causes of death in both women and men.